Skoda are preparing for the global launch of their new Citigo subcompact at the 2012 Geneva Motor Show. Before its world premiere in March though, Skoda are giving us a sneak peek at the five-door Citigo. With the Citigo, Skoda are making a new venture into the subcompact market, looking to capitalise on their remarkable achievements in 2011. The end of 2011 saw Skoda celebrating a landmark year, with record breaking numbers of vehicle registrations, up by 9.3%. Skoda also received a total of 18 major awards for its performance and customer service during the year. Meanwhile, the Czech Citigo launch took place. The car received a warm reception in its home market, winning the Best City Car award in the Czech Car of the Year poll. Now, the original three-door and brand new five-door Citigo models are set to take Europe and the UK by storm too. 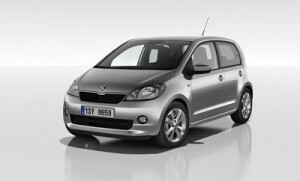 Both Skoda Citigo’s will be available for purchase, lease and finance (subject to status) in mid-May. Once again Skoda engineers have managed to combine compact dimensions with spaciousness. Despite being one of the most compact cars amongst its competitors, the Skoda Citigo is also one of the roomiest inside. Plus Skoda have designed a variety of ingenious devices to make everyday life smoother and easier. These include a photo and document holder, a selection of net storage pouches and an integral bag hook on the glovebox. It will also be the first Skoda manufactured with the new Skoda logo. The Skoda Citigo can boast the top-ranking five star rating in the tough Euro NCAP crash test. And the Skoda Citigo’s engine has impressive green credentials too. The ultra-efficient Green version of the Citigo’s engine combines a mileage of 4.1 litres per 100 kilometres with CO2 emissions of only 96g/km.